I peered outside my window curiously as the airplane began its descent. I was returning to Chennai after two decades; the city was called Madras then, and not exactly a popular destination. How things have changed! A recent Harvard School study forecast Chennai as the next big IT city in India (after Bangalore). From the sky, I could see more greenery than I had expected. Pune is reeling from an unusually hot summer right now, so even the weather didn't seem too bad to me. I stayed at Le Royal Meridien, about 15-20 mins drive from the airport. The hotel is very unremarkable from the outside (only four stories high, and looks old from the outside). However, the atrium/lobby area and the three restaurants are of good quality. 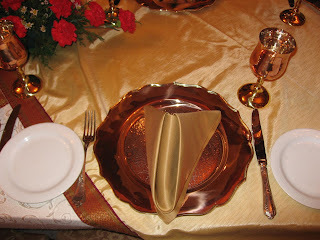 The Gold Club rooms were large, nicely appointed, but haven't been refurbished any time recently. I spent a few hours with colleagues at the lobby bar (called the Dome). Cricket continues to rule supreme even though India has crashed out early, disappointing a billion people, and bringing TV sales crashing down all over the country. The TV in the bar was showing the cricket match between West Indies and Sri Lanka and the waiters were dressed up in the teams' colors. 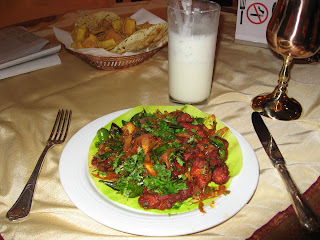 During this visit, I was able to eat at the Cilantro and Navratna. The Cilantro serves breakfast and lunch buffets, and is always crowded. The Navratna, serves what they describe as Royal Indian Cuisine, is quieter, has an interesting decor, and serves local South-Indian delicacies (they also have North Indian dishes that I didn't try). The Guntur Kodi Vepudu is a very spicy starter made of boneless, succulent chunks of chicken marinated in South Indian spices. 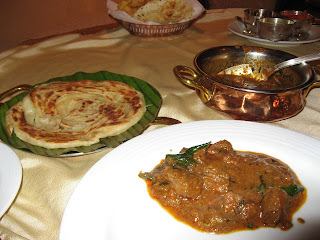 I loved it, as I did the Mutton Chettinad curry which I polished off with some very good Kal Dosa (the Kal is a hot stone on which this dosa is cooked) and Malabar Paratha (flaky South Indian bread). 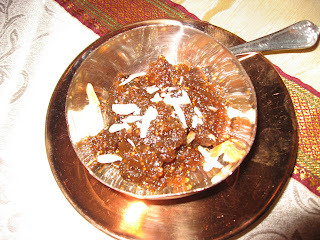 And finally, for dessert, I recommend the Athipazham Halwa which is made of figs and the black-currant ice-cream.